When I made the switch from teaching music to technology, one of the topics I was most excited (yet also most scared) to teach was coding. I’ve read articles and blog posts about the importance of teaching students how to code (one of my favorite resources is here: https://code.org/promote) and knew that I wanted my students to have the opportunity to experience computer science in my class. I firmly believe that it is our responsibility to expose all of our students – especially girls and students of color – to computer science and the countless opportunities that are available to students who wish to pursue this as a career. With everyone from NBA players to President Obama pushing for computer science in our classrooms, I was ready to jump on board! Only problem was, I’d never taken a computer science class before. Well, with the exception of the short unit in BASIC programming we had in “Keyboarding Class” in 8th grade (which was a welcomed break from the endless typing games we had to play), I have spent the majority of my technology-centric life as only a user. So, I went over to Code.org and started by completing the Angry Birds-inspired Hour of Code. I was instantly hooked, and immediately signed up for the next K-5 Computer Science Fundamentals workshop in Chicago. The workshop provided us with time to explore the 3 (now 4!) self-paced courses Code.org offers on their website, as well as an overview of the “unplugged” lessons the curriculum offers to reinforce the concepts of algorithms and programming in off-line situations (such as writing algorithms for planting a seed or using loops to write song lyrics). One of the most powerful pieces of advice I took from the workshop was the idea that it is okay to not know the answer to a student’s question about coding. Code.org suggests teachers respond to these situations by saying “let’s figure this out together!” which has guided my entire philosophy of teaching computer science these past few months. I was energized and ready to teach coding, so I decided to start my 4th and 5th graders on the brand new Star Wars Hour of Code (albeit a few weeks earlier than the actual Hour of Code was to take place!). While I may have been a little nervous introducing it to my students, they could not wait to type in their brand new log-ins (which the Code.org teacher dashboard made a breeze to create and print out) and get started with programming BB-8 to collect scrap metal and R2-D2 to save Rebel Pilots. And those that finished ahead of their classmates got to try out the even newer Minecraft Hour of Code. Seeing my students excitement for this one hour of code helped me realize how important it would be to continue their learning by having them complete one of the Computer Science Fundamentals courses. Naturally the students took to it quickly, and many passed the highest level I had completed in Course 3, prompting numerous “let’s figure this out together” moments, which actually proved to be a great lesson to me in that I don’t always have to be the expert in the room to be an effective teacher. So, what’s next? Now that all of my students have embarked on a computer programming challenge in my technology classes, I am thrilled to keep the excitement and momentum going! I plan to continue my own computer science education (I still need to complete those Khan Academy courses before my middle schoolers do!) and find ways to foster student interest through an after school coding club in the future. Also, I just recently finished our school’s application to be part of Chicago Public Schools’ Computer Science for All (CS4All) initiative, which provides support for all elementary schools to offer computer science courses through Code.org and prepare them for the computer science credit requirement that all high schools will be instituting in the coming school year. It’s been an exciting first year as a technology teacher, and I am excited to see where coding continues to take me and my students! I don’t tend to jump on buzzwords in education, but after reading countless articles and blog posts and sitting in on a few conference sessions about STEAM education (that’s science, technology, engineering, arts, and math), I was hooked. What I like best about this concept of STEAM is that it is something all good arts educators already know how to do: arts integration! For years now our principals have asked us music, art, dance, and drama teachers to integrate with other subjects, but it tended to be only the social studies and writing teachers who approached us. With this new emphasis on including the arts into STEM education, it’s like we have finally received the green light to collaborate with the science and math teachers we’ve been longing to work alongside. Well, perhaps that’s just me, as I’ve always felt a greater inclination towards math, science, and technology. But regardless, any time the arts can be purposefully integrated into a lesson is a win in my planbook! In my own music classroom, I am only just beginning to explore this concept of purposefully integrating music with STEM learning. 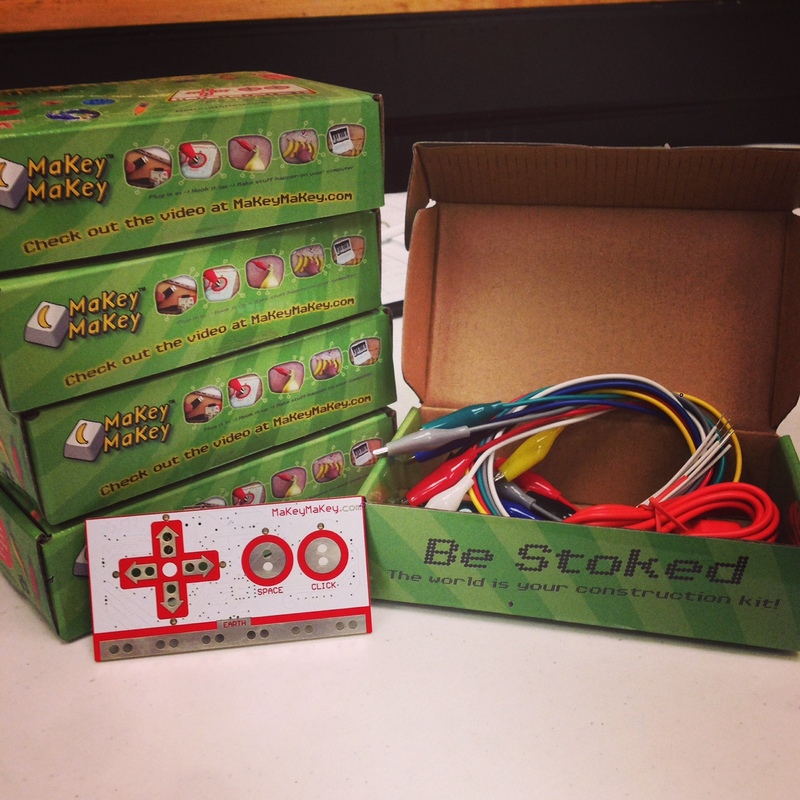 I received a huge jump start on this endeavor when a DonorsChoose plea for MakeyMakey invention kits was fulfilled in a matter of days this summer, providing me with some fun new toys to utilize with my students that connect technology, basic coding, and music. Plus I have four littleBits Synth Kits – purchased with a grant received from the Illinois Computing Educators – that have also allowed me to connect the science of sound production with music composition in my classroom. But this is only the beginning of my investigation into STEAM education, and I look forward to continuing my pursuit. And, of course, I am happy to share my learning along the way; I have already presented on STEAM at the Illinois Golden Apple’s Teachers for Tomorrow conference in September 2014 (view my presentation here) and have future presentations on STEAM and maker education in the music classroom at the Illinois Computing Educators (ICE) Conference on February 27, 2015 and at the Michigan Association of Computer Users in Learning (MACUL) conference on March 20, 2015. And, I’ll be posting much more about my journey into STEAM here on my blog in the coming months! Riley, S. (2014). No permission required: Bringin S.T.E.A.M. to life in K-12 schools. Westminster, MD: Visionyst Press. Author Bill MarslandPosted on January 23, 2015 January 23, 2015 Categories Educational TechnologyTags edtech, littleBitsSynthKits, MakeyMakey, STEAM, STEMLeave a comment on Full STEAM Ahead! On Thursday, August 14, 2014, I had the opportunity to attend a unique event featuring a wide-range of educational technology start-up companies. This is the second year the Educational Technology Start-Up Collaborative has held a conference in Chicago to introduce K-12 educators to new and innovative tools that are just getting off the ground. The format of this conference is simple: each start-up in attendance gets 3 minutes to pitch their product to the audience. Start-ups spend the rest of the day talking with teachers about their product, providing hands-on demonstrations, and even recruiting teachers to get their classrooms involved in their start-up project. This year, specialized workshops were offered in addition to the start-up showcase, allowing participants to explore topics in literacy, STEM, and design in a focused environment. You can view my notes on the start-up tools I learned about as well as the STEM and design workshops I attended by clicking here.